We began our travels early. 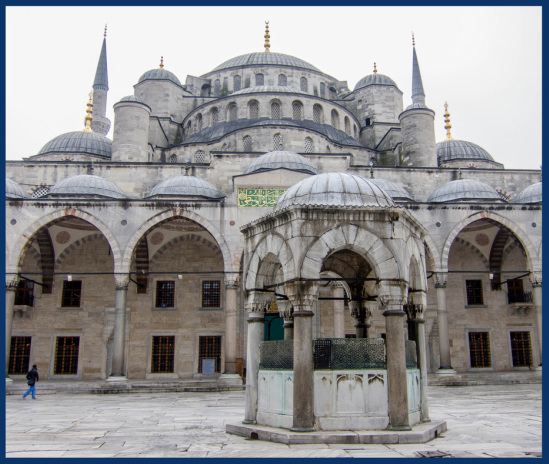 While I'd heard of the Blue Mosque, I had no idea of its history or the reason why it got its nickname (I learned that it's called Sulton Ahmet Mosque by Turks). 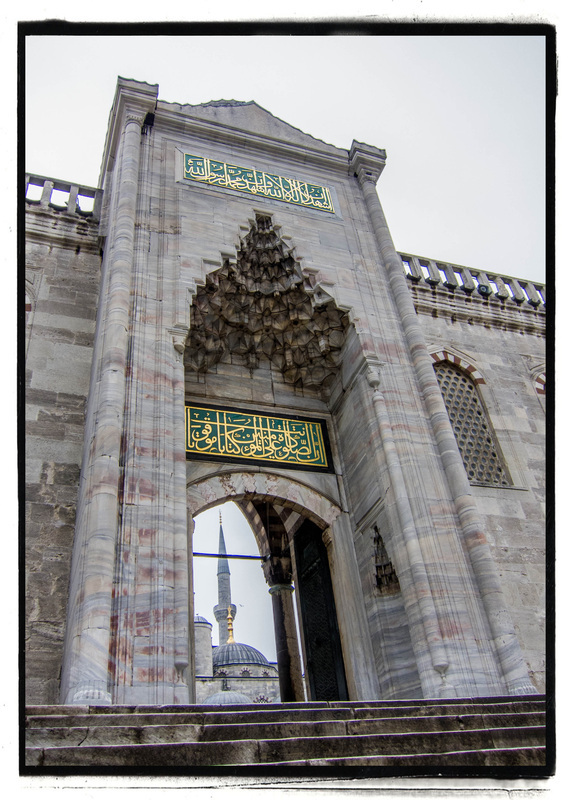 As soon as we entered,it was obvious where the name Blue Mosque originated. The walls are covered with rich blue tiles. To enter, we all took off our shoes and ladies covered their heads with scarves or hats. Once we were all in, Mert took us to a side section where he spent time giving us a thoughtful education of the Islam faith. I found myself thinking about how little we know about its practices in our western culture. Istanbul has MANY free-roaming cats. All colors, although there seems to be a strong line coming from black and white ancestors. We'd see them everywhere, and some would accompany us as we walked along. Inside the mosque, I was completely surrounded by color. It was explained that Islamic tradition forbids the depiction of living beings, so all decoration utilizes floral, geometric, or calligraphic design. Our free time allowed us to simply gaze about in awe. 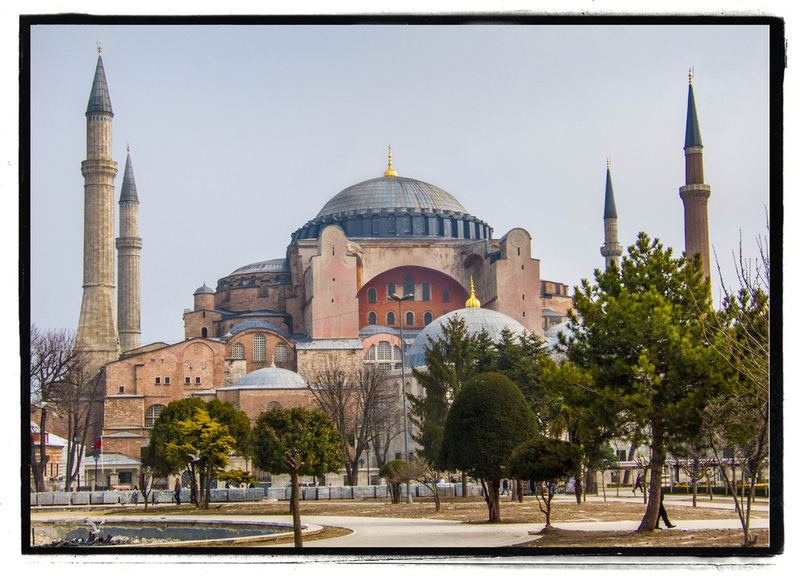 Directly across from the Blue Mosque sits the legendary Hagia Sophia. Looking at it, I felt that I was seeing a true masterpiece. There's something so grand about how it sits and its architectural balance. 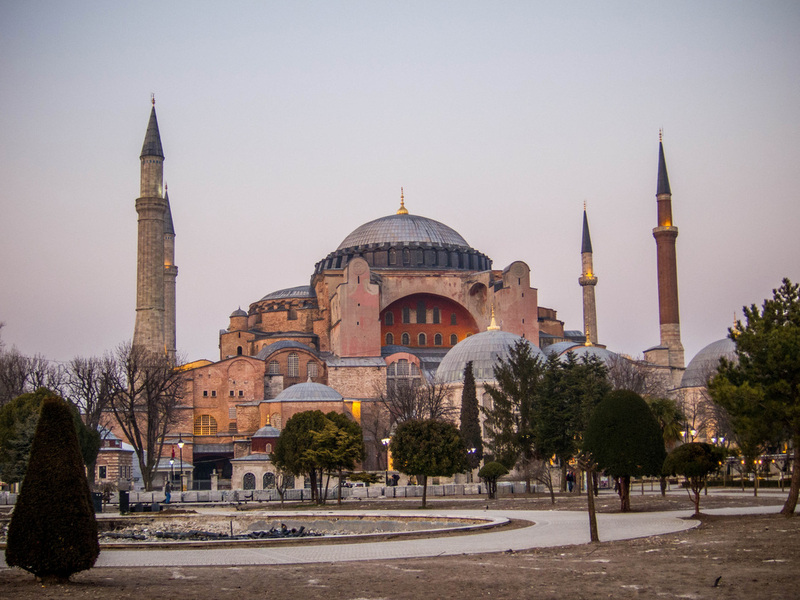 First used as a Christian church, it was converted into a mosque when the Ottomans conquered the city. Since the 1930s, its been a museum. These photos of Hagia Sephia's interior give an idea of its vastness and beauty. March 20th - this is the day! It's our official 25th anniversary. We climbed up to the surrounding second story and were able to look down into the massive central area, where the lights seemed to be floating in space. What a magical place! When we finished at Hagia Sophia, it was time for lunch, which was on our own. Mert gave us an overview of different choices. Fred and I joined up with some of our group and tried one of Rick's recommendations, Sultanahmet Köftecisi. It was a good choice and we had plenty to eat! Since we still had some time, Fred and I wandered over to what had once been the Hippodrome. We read that this area was a huge racetrack (mostly chariots) going back to the 4th century. It's still an open area and seemed to be a gathering spot as well. These two obelisks, part of the original decorative monuments, still stand. Column of Constantine, relatively new from 'only' the 10th century. I found the carved base of the Egyptian Obelisk intriguing. It actually illustrated how it was raised into position! Why can't we have more pictures to solve all life's mysteries? It was time to return and leave for Chora Church. 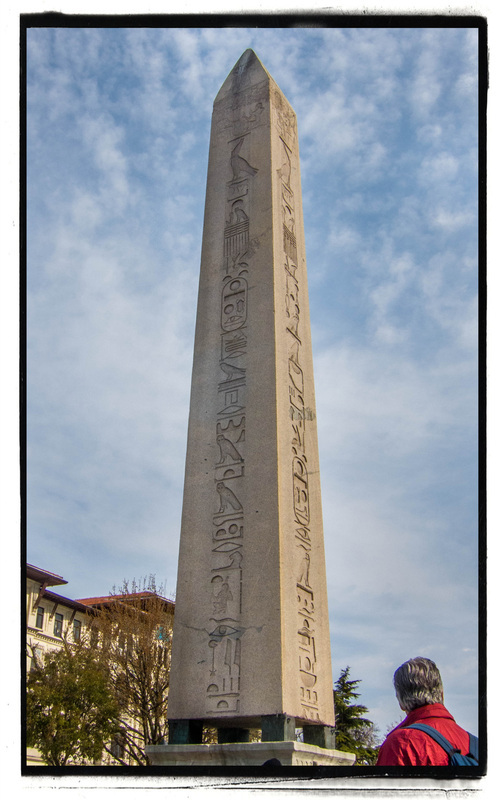 Egyptian Obelisk, carved 1500 b.c. On our way to Chora Church, we passed along a street in Istanbul that specialized in wedding gowns. It was fascinating to learn that Turkish women choose the same types of gowns as we do in our western culture. Since most of the dresses were displayed above the street, we got a great view of all the selections from our bus. Chora Church is known for its wall and ceiling mosaics. The church was almost empty and we had a chance to walk around on our own and really examine the intricate artwork. 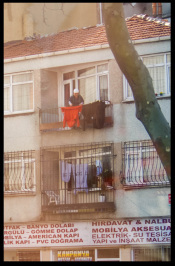 Seems like these clothes might acquire some city 'fumes' while drying. Fred and I loved having the opportunity to visit this church. Besides their beauty, we learned that these mosaics and frescoes helped to impart Christian beliefs to followers. Outside, there was a friendly vendor who was sure that I needed a Fez to wear. What he didn't count on was my head being way too big for 'one size fits all'. 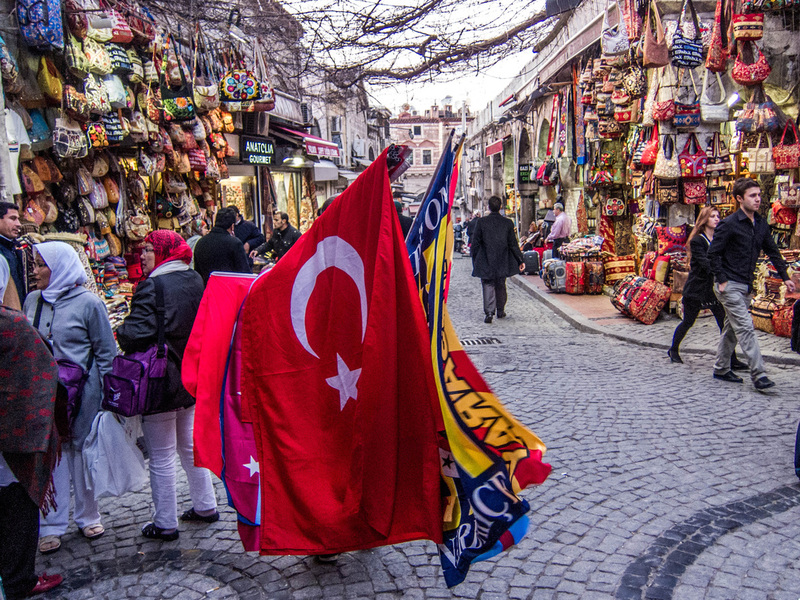 Since our time in Istanbul was limited, we had the option of our bus dropping us off at the Grand Bazaar as we headed back into the Old Town. Definitely a must! 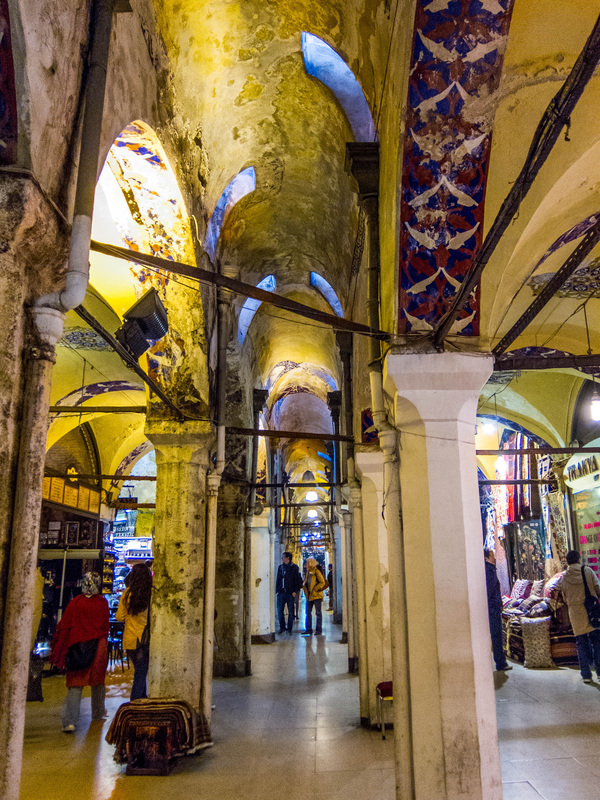 If the Spice Market is large, then the Grand Bazaar is HUGE. Someone could disappear in there for days. If not days, one could certainly spend many hours here. There's a complex of buildings and several floors of shops. One of the vendors was calling to Fred to buy something for me, the Big Cheese, and it initially I thought he was saying something else - I finally figured it out though. 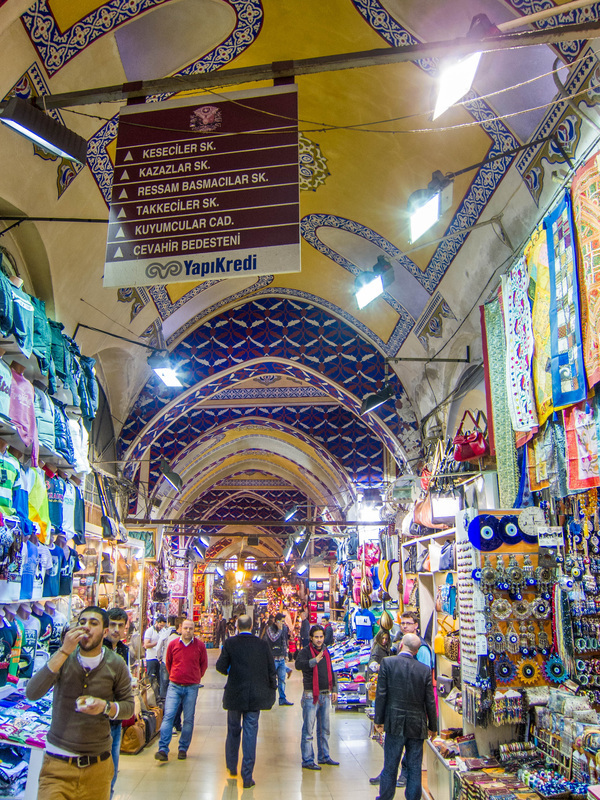 The walls are full of many kinds of merchandise and each aisle has a beautiful painted and/or tiled ceiling. It's hard to figure out where to look first. These textiles were hard for me to pass up. Sadly, there wasn't room in my luggage for pillows. 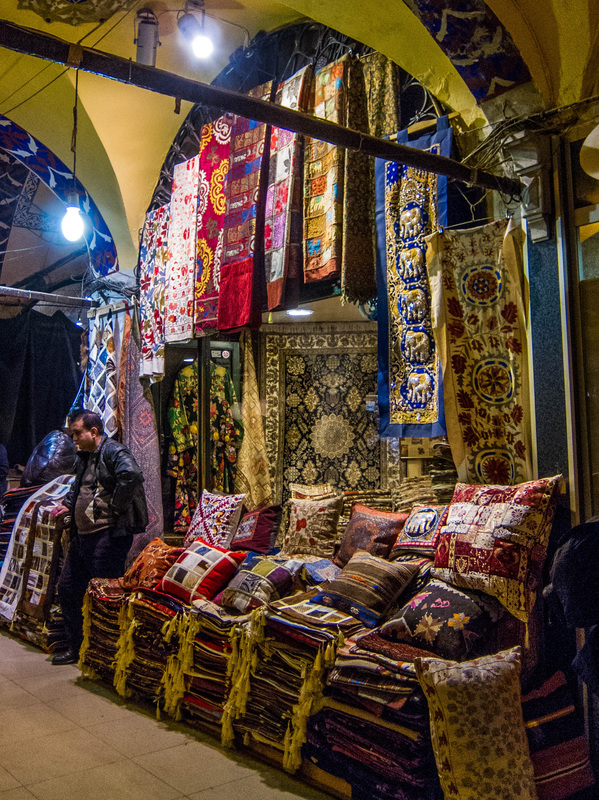 The streets outside the bazaar are filled with, as one vendor put it, 'Everything you need'! We decided to walk the few blocks from the bazaar to our hotel. As we left, we passed even more streets filled with merchandise and eager vendors. We walked slowly, enjoying the twilight in a magical setting of domes and minarets - and cats too. Why can't we all just get along?? With all the outside space available, Turkish cats have their boundaries and, apparently, don't like intruders.